This weekend was Raksha Bandhan. It is a festival where a sister ties a Rakhi (which is like a wristband made from coloured thread and beads), around her brother’s wrist. This is to wish him prosperity. In return, her brother gives her a gift. In Australia, I have always been aware of this festival, primarily because I was actually named after it (for those who don’t know my true identity, there’s a small hint). I don’t have a brother, but I do have a cousin in Australia, and when we were very young we celebrated this festival. It seems to have gone by the wayside now. We get older, life gets busy and you forget these things. Here in India, you can’t forget. 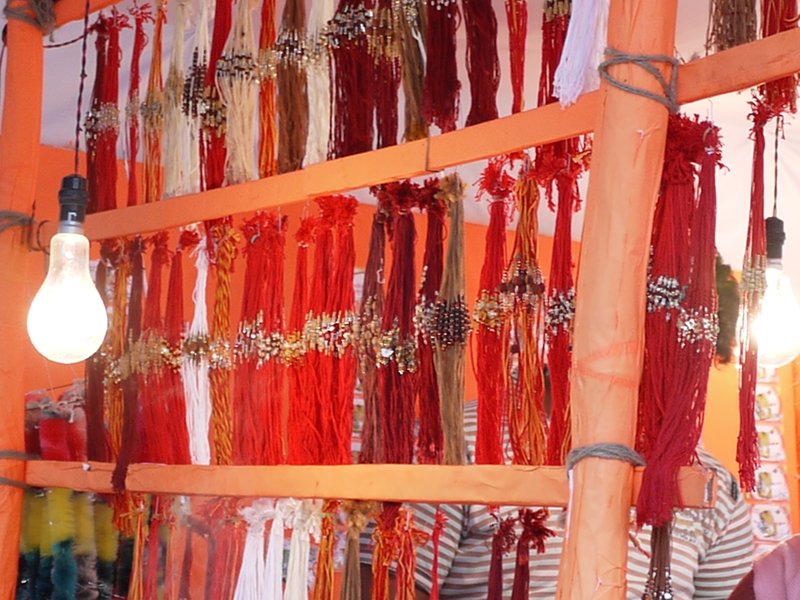 Every street corner has a Rakhi stand, with brilliantly coloured bands for sale. People spend hours carefully selecting their Rakhi’s in preparation for the day. On the day, the streets are busy with all the women making sure they visit all their brothers. I am staying with my cousin brother here in Vadodara. He has four sisters, but only one lives here in town. She comes around and ties four Rakhi’s, one for each sister. They then feed each other sweets and have a laugh. 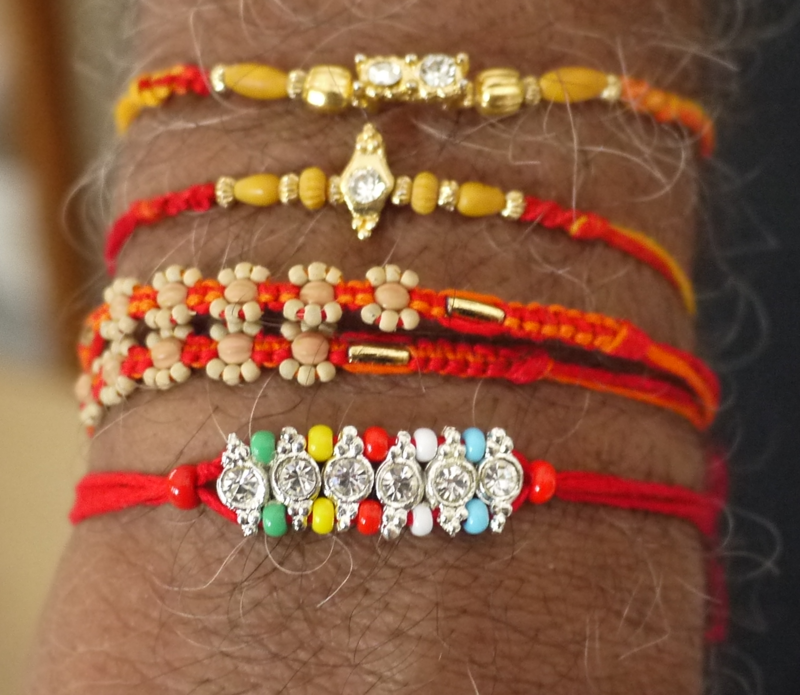 As a sister, I also tie a Rakhi around his wrist, and am rewarded with a gold packet. In the afternoon, everyone goes shopping, to spend the money that has been given that day. The malls are so busy, I actually see the traffic police for the first time. They aren’t directing traffic today though, that would be futile in India (see this post), they are clamping up cars that have double parked. Given the atmosphere in the town, I doubt that a clamped car would dampen the mood. There is a spark in the air, people are happy and cheerful. Families are together and enjoying the spirit of this festival, that celebrates what they have.. no matter how little. When there is a festival to be had, Indians are all in, nothing is done by halves here. There is a lot the west could learn from their attitude. I hope you enjoyed Your day and I love the wristbands- beautiful! I really enjoyed this post. I’m getting such insight into the nuances of Indian culture from this blog. I love it! Great way to get the economy moving, it should be introduced everywhere!